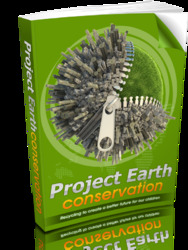 Emergy evaluation describes the relationship between human and natural systems. There have been many studies on this interaction; here we chose one that assessed the environmental impact of a fish farm. Aquaculture has many interactions with the surrounding environment using resources and producing changes in the ecological system. The fish farm, in this application, is located in the Gulf of La Spezia (Ligurian Sea, NW Mediterranean Sea). 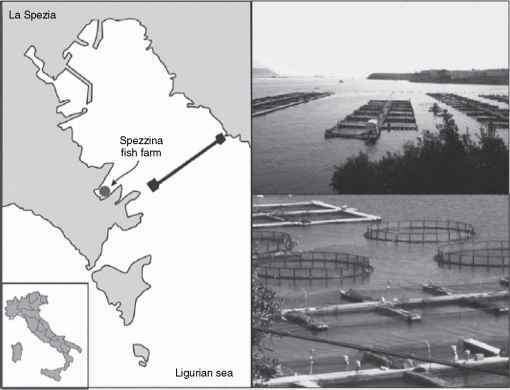 The installation called Spezzina fish farm is a marine inshore fish farm located at Punta Pezzino; this area of Gulf of La Spezia is sheltered by the offshore breakwater and is thus characterized by a low circulation regime (Figure 5). Reared fish are mostly gilthead sea bream (Sparus aurata) and sea bass (Dicentrarchus labrax) to a lesser extent. In the study only S. aurata production is considered in the emergy calculation. Figure 5 Spezzina fish farm geographical position and cages disposition. Reproduced by permission of Elsevier. of about 12 m. Average production is reported to be 350 tonnes of fish per year. Food supply takes place twice a day with an automatic system and the fish diet varies both in composition and quantity in relation to biological factors (i.e., age, biomass, and starving) and in relation to climatic and physical factors (i.e., water temperature, and dissolved oxygen). Moreover, the farm is equipped with an automatic system for oxygen spreading installed under the cages; it is utilized when oxygen concentration falls below a threshold level considered dangerous for the health of the reared fish. Fingerlings are introduced in to the cages in two periods: in spring (from March to June) and in autumn (from September to November). The total number of fish introduced is roughly 1 300 000 each year; fingerlings experience a 20% mortality rate. 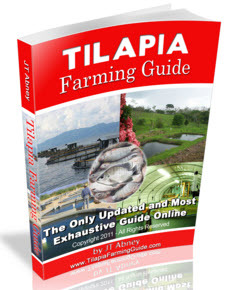 Fish reared in Spezzina fish farm spend 16-18 months (depending on weather, size, and period of introduction) to reach the size needed for the yield (350 g) and the farming is managed to obtain at least 7.5 t of fish each week to meet the market demand. The energy system diagram of the system, under study, is reported in Figure 6. Table 1, constructed from the diagram, shows the actual flows of materials, labor, and energy and all flows are evaluated. For the analysis the different inputs have been identified and grouped in two categories: renewable and nonrenewable resources. The total emergy flow, obtained by summing all the independent contributions, made it possible to calculate the transformity of fish, given the quantities produced (see Table 1 ) and assumed that each kilogram of fish corresponds to 800 kcal (3.35 x 106J kg-1). Three other systems producing fish are selected for comparison: two intensive fish-farming systems producing, respectively, salmons (Salmo salar) in the Umpqua river estuary and tilapia (Tilapia mariae) in the Nayarit, Mexico; the third system (Valle Figheri, in the Venice lagoon) produces S. aurata but in a seminatural extensive manner. Assuming that the fish are all of the same quality if transformities are considered, T. mariae and S. aurata rearing showed the highest efficiencies, probably due to more favorable weather conditions of the areas that allow growth of the fish in an optimal temperature range. Furthermore, T. mariae is well known as an easily reared fish because of its very good adaptation to various conditions. Nevertheless, differences in transformities may also be due to the different species or to a different type of rearing system. 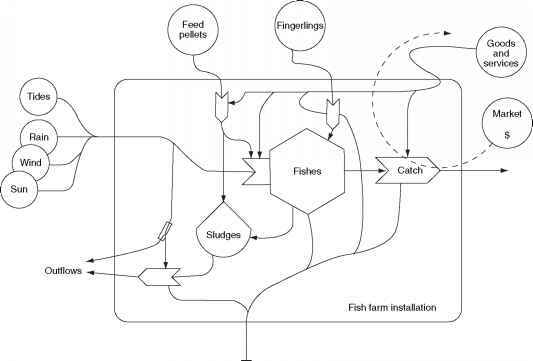 Figure 6 Energy diagram of Spezzina fish farm. Reproduced by permission of Elsevier. Reproduced by permission of Elsevier. showing a good accordance with the maximum empower principle. On the other hand, Spezzina fish farm and Valle Figheri produce the same kind of fish but in drastically different systems: one is very intensive in a narrow gulf in the Ligurian Sea; the other is an extensive system that tries to use all the natural resources available in this artificial ecosystem. The result is a much lower transfor-mity for the system under study, meaning that Spezzina fish farm is more efficient in producing fishes, even though the production is much more dependent on external and nonrenewable inputs. Table 2 Comparison between emergy indices from Spezzina fish farm and similar production system. ELR for the Spezzina fish farm showed that fish rearing needs for the larger part, nonrenewable resources for its maintenance: nonrenewable external inputs are five times higher than renewable ones. If this result is compared with other similar production systems (Table 2), the dependence on nonrenewable resources of the S. aurata with respect to S. salar net pen culture in Oregon is higher, but much lower if compared with T. mariae rearing in brackish water in Mexico. These results could be related to differences in the role of natural systems for the S. salar culture that take advantage of the wide tidal range that characterizes the Oregon coasts; while for T. mariae culture, value is strictly affected by the external inputs and is higher than what is detected in other systems. Nevertheless, all these results are very relevant if compared with the seminatural system in the lagoon of Venice, where renewable inputs are three times larger than nonrenewable ones. As a direct consequence of what is observed for the ELR, values of EYR in Spezzina fish farm are quite low and close to the unit. This is an indication of the prevalent dependence of the analyzed system on the economy and on human control. This kind of result is typical of systems unable to exploit natural resources and is based on the import of inputs characterized by high emergy. This is true also for the other intensive systems: especially T. mariae rearing, which, in fact, is much more dependent on expensive, nonrenewable resources with respect to what is observed in Spezzina fish farm. On the contrary, the extensive system shows a very high contribution from the environmental inputs, although at the cost of a lower productivity. According to emergy results, a significant improvement toward the environmental sustainability of the examined process could be derived from the modification of the productive cycle that should, for example, include the in situ fingerlings production that have the highest emergy input in the evaluation. Moreover, it is advisable that in Mediterranean conditions the fish farm installation was disposed in the widest possible area so that natural resource contributions could be more significant.